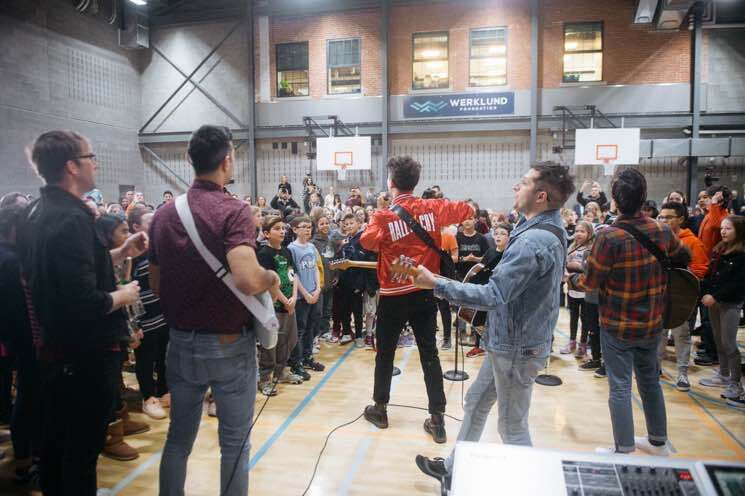 Arkells are currently touring their latest album Rally Cry across Canada, but the Hamilton rockers made an unexpected extra stop in Calgary yesterday (February 6). The band surprised students at the Calgary Arts Academy and joined them for a performance of "People's Champ." Students at the school won the 2018 MusiCounts Passion Prize for their rendition of "People's Champ," but when they were asked to perform it again at an assembly, they had no idea that Max Kerman and co. would be joining them. The band snuck into the gym and joined in on the song, then performed "Knocking at the Door" for the kids. Each year, MusiCounts and CBC Music host the Canadian Music Class Challenge, awarding the winner a $5,000 grant for instruments. Revisit the Calgary Arts Academy's original winning performance here, and check out footage of yesterday's surprise performance below via iHeartRadio. The band perform at the Calgary Saddledome on Saturday (February 9). See their remaining tour dates here.